October 2nd – 31st.- Peruse the pumpkins, scrutinize the squash at the popular Bloedel Reserve Annual Super Squash Scavenger Hunt. Use the map to find the hidden squash around the eerie grounds. Enjoy the fall colors while strolling the grounds of the beautiful former private estate with formal gardens. 7571 N.E. Dolphin Drive, Bainbridge Island. Weekends thru October – Kitsap County Haunted Fairgrounds. Be prepared to be afraid, very afraid of the dark from October 5, to Halloween at one of the most popular haunted places in the region! See Fairytales Gone Wrong. Explore this twisted realm as you re-visit your favorite fairy tales. There’s always a nice, warm and comfortable place to stay nearby safe from zombie and other very scary attacks. Book a room some October weekend and make it a party! October 6th – The all time classic Rocky Horror Picture Show at the indie theatre Dragonfly Cinema in downtown Port Orchard. Go early and do dinner at one of the local spots on the waterfront. October 6th – Check into the Inn at Gig Harbor Friday night and after a leisurely breakfast head on down to Sehmel Homestead Park, 10123 78th Ave. NW. Gig Harbor’s Scarecrow Festival undertakes an autumnal celebration with family friendly activities, Scarecrow Competition, music and a Pumpkin Launcher! Free admission. October 5, 6, 19, 20, 26, 27, 31 Port Gamble Ghost Walks – guided tour of Port Gamble highlighting the town’s history of the paranormal. Includes tours of the more active buildings in town. Must be 16+ to attend. $25 per person, reservations not required. The tour starts at the Port Gamble Historic Museum at 7:00PM. Visit site for tickets and details. October 26th & 27th On the final scary weekend, scare the pants off the kids at 2nd annual Haunted Heronswood when the garden lights up for two nights of Halloween haunts and festive food and drink. New this year a Trail of Terror (for those wanting to set their hearts racing), a Spirits & Spirits Beer Garden featuring area microbrews and hard cider, and an all-ages festive food and beverages tent. Wee ones and those wanting a calmer heartbeat will enjoy strolling through Jack O’ Lantern Lane, past vignettes inspired by S’Klallam folk stories and traditional Halloween characters. October 28th – Bay Street Boo Bash – Trick or treat in downtown Port Orchard on the Saturday before Halloween. Kids and pet costume contest and parade, trick or treat, haunted library, cinema, pictures with a witch and scavenger hunt! October 28th Enjoy the great outdoors at the13th annual Roots Rock Spooky 12k that takes place in haunted Port Gamble, where the hills aren’t the only scary part of this race! Dress up for this one, with the best costume contest to follow the race. The Spooky 1 Miler is free and for the kids only. Run into the woods and follow the trail to see the old bears den before running back to town! October 31th Many downtown arts and business districts are are hosting family-friendly Trick or Treat Celebrations. For more information, but click on the names of each locations. Downtown Bremerton, Ghoulsbo Halloween Celebration, Bainbridge Island Halloween Walk, Kingston Halloween Carnival, Trick or Treat In Gig Harbor, Visit the VKP Calendar of Events for more listings and updates. Travel to VisitKitsap.com to learn about our great selection of lodging options for a spur-of-the-moment fall getaway. The Kitsap Peninsula is just a short 30-60 minute ferry ride from the Seattle area or from Tacoma by bridge; the prefect place for a quick break from the hectic urban scene and all that traffic. A mid- or weekend getaway will give you plenty of time to take in some spine chilling experiences or just unwind with a stroll along our beaches and trails. 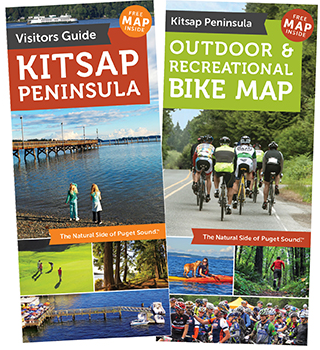 Nearly every town on the Kitsap Peninsula is located on the water with warm and welcoming hotels nearby, beautiful scenery, shops and eateries for all tastes and budgets. Just a ferry ride or bridge away! Click here for a WA State ferry schedule.